Looking for that heavenly taste in a teacup? I may have just found it: Angel’s Dream Tea. It’s a flavored tea that evokes thoughts of pancakes and fruit sundaes all at the same time. Angel’s Dream — a flavored tea that still lets the tea taste come through! Flavoring and scenting teas has been a tradition for centuries, in fact, about as long as tea has been consumed by humans. Some flavored/scented teas are classics, that is, they have been around awhile — such teas as Jasmine Greens and Lapsang Souchong, plus Earl Grey and masala chai. Coming up with a new flavoring combos is the challenge, therefore, to vendors trying to compete in an increasingly crowded marketplace. Lots of vendors are working on new flavorings. You can see their latest results touted on Twitter and Facebook. Angel’s Dream is a flavored tea that doesn’t drown out the tea taste with the flavorings. The key seems to be the tea “base” — they start with quality teas that can hold their own through whatever gets added to them. Teas from Sri Lanka (Ceylon), Formosa(Taiwan), and Assam(India) are great on their own. In fact, they are some of our favorites, both individually and in blends. The Ceylon and Assam teas can get a bit bitter or astringent on their own, so many folks like hubby and me tend to add a bit of sweetener and even some milk to them. But combined with the Formosa tea and with the added flavors of maple and wild blackberry, that edginess is gone. The tea steeps up the way you would most black teas: boiling water and 3 to 5 minutes. Hubby and I steeped it for only 3 minutes, and the liquid and flavor came through fairly strong. We did a second steep for 5 minutes from the same leaves and had a result that was almost as strong as the first but with a more maple-ish flavor. We have found this to be typical of flavored teas. Keep the first steep a bit short. You will still get strong flavor yet have enough left over for a flavorful second steep, and extend that second steep time a bit. Like most Assam and Ceylon teas, a bit of milk can be a nice touch. Even this flavored version can take some milk in it. Hubby and I tried it that way and found it was very satisfying and dessert-like, like others we have tried. A flavored tea that can also be enjoyed with milk, if you prefer. 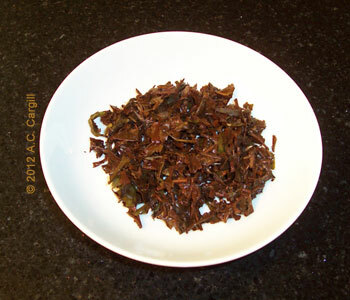 One final note here: when trying a tea, take a look at the tea leaves after steeping, for they can tell you a lot. In this case, the leaves tell you that this is a broken leaf tea and shows the mix of Taiwanese (Formosan) tea with the others. A good sign! The leaves after steeping tell the story of quality!